There’s no doubt that riding scooters is fun for kids, and rapidly growing as a popular outdoor activity for children as young as toddlers. But scooters are great for kids for more reasons than just recreation. Believe it or not, scooters help kids develop fine motor skills starting at a young age, which benefits them in a variety of ways as they get older and go through school. Scooters also help kids develop a sense of balance and direction, and it’s easy to master which gives them the confidence they need to tackle more new activities and learn more new skills. There are lots of different brands and models of scooters out there, but we’ve selected a few of the best ones to narrow down the selection and make the vast array of options a bit less overwhelming. This scooter is one of the top rated models for children ages two to five. It’s adjustable T-bar can be raised to accommodate a child’s height as they grow. It rides smoothly and quietly, and allows riders use their body weight to lean as they steer left and right, making the turning mechanism more intuitive. It also comes in a wide selection of color choices including aqua, blue, green, lavender, ocean blue, orange, pink, purple, red, and yellow. It is rated 4.8 out of 5 stars by reviewers on Amazon. Razor has been around since the beginning and has made a name for itself in the scooter industry. Rated 4.8 out of 5 stars by Amazon reviewers, this model is priced affordably and geared toward older children who have mastered their basic balancing and steering techniques. 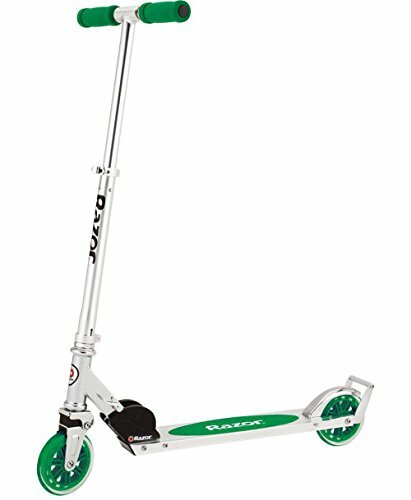 This model is your classic kick scooter designed from aircraft-grade aluminum known for its sturdiness. It boasts a rear fender brake great for making quick stops, and even has a wheelie bar. It is foldable and easy to carry, and its small, rubber wheels make it great for speedy rides on paved surfaces. This scooter is stylish and great for beginners. 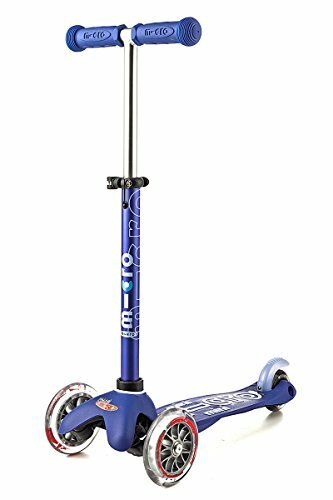 The best performing scooter for kids ages six to ten, its gliding, rubber wheels guarantee a smooth and balanced ride. Its wide handlebar provides more control for little ones still learning how to balance. It has a rear foot brake and an extra wide platform. Plus, every part of this scooter is replaceable, so technically it can last a lifetime! Rated 4.9 out of 5 stars, you won’t regret your choice with this one! 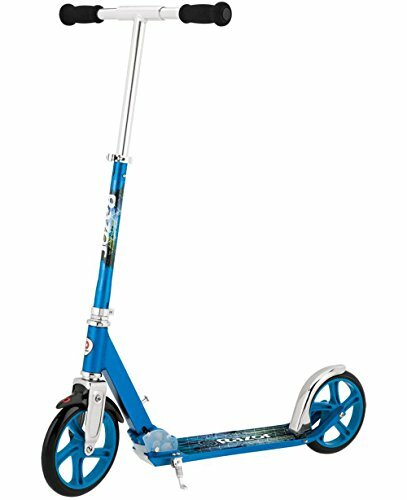 One of the top advanced scooters on the market, this model is built for speed with its metal core 120 mm wheels. It is extremely durable and dependable, and can be expected to last a long time. 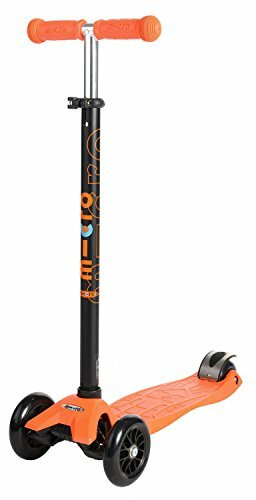 Rated 4.6 out of 5 stars by Amazon reviewers, this is one of the top selling scooters on the market. Love the Razor brand but looking for something a little sturdier in the wheels department? 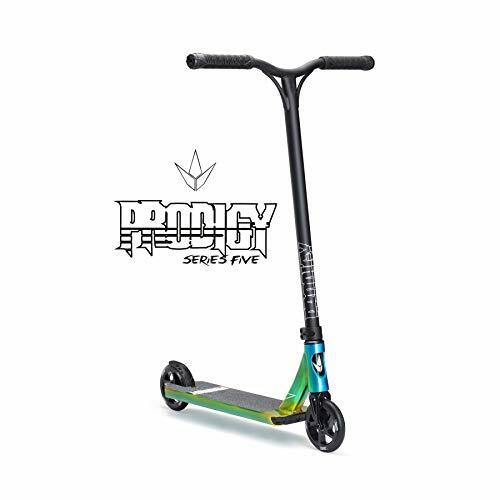 This model has all the durability and performance that Razor scooters are famous for, but with extra large urethane wheels that can maneuver unpaved surfaces or just provide added balance. It’s extra thick foam handles add comfort and control, and its adjustable handlebars make it easy to fold and carry. Rated 4.7 out of 5 stars on Amazon, this ride is a safe bet for ages eight and up. 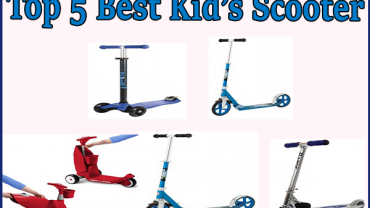 It’s important to know what to look for when choosing a scooter for your child. One of the most important things to consider is the age of your child. While scooters started out as being primarily for teenagers and pre-teens, you can now find scooters for toddlers as young as 18 months. Naturally, there will be differences in the scooter you choose when you’re shopping for a ten year old, versus shopping for a three year old. When shopping for a younger child, one of the first things you’ll want to consider is the number of wheels. Kids scooters have anywhere between two and four wheels. The more wheels the scooter has, the more stable it will be. If you’re shopping for a toddler, look for a scooter with three or four wheels. This will help them to find their balance more easily. After some practice, your toddler will be ready for a scooter with only two wheels, but try to find one where the platform is a bit wider, as this will help with maneuverability. For older children between six and eight years old, a scooter with two wheels and a narrow platform should be fine. Often around age ten, children stop riding scooters and gravitate toward bikes and other hobbies. However, if your child still enjoys riding a scooter after age ten, they should be ready for a more advanced model. Another thing to consider when choosing a scooter is its height. Choosing the right scooter is like choosing the right pair of shoes – the proper fit makes a big difference. When your child stands on the scooter, they should have straight posture with their arms bent slightly at the elbows. The handlebar should be at the level of your child’s chest when he or she stands beside it (not on it). The height of the scooter is very important because if the posture is incorrect, it can result in hurt back and arm muscles. Another factor to consider is the wheels on the scooter. Wheels that are large and narrow are best for unpaved roads, but these do not make for the fastest or most maneuverable scooters. Scooters with small, rubber wheels are only suitable on paved surfaces, but they make it easy to speed up. Also, the wider the wheels are, the more stable the scooter will be. There are a lot of scooters out there, and choosing the right one can be tough. In the end, the best scooter depends on the child riding it – their preferences, their skill level, and their relative age and size. But picking out a scooter doesn’t have to be an overwhelming or lengthy process. It’s supposed to be fun, so as you consider all your options, remember to enjoy the ride!